I know everyone is hyped about seeing Spider-Man in the latest Captain America: Civil War trailer, but can we take a moment to recognize how awesome Black Panther is? We’ve seen the character in action already but the footage released today gives us a much better look at what he’s capable of. I would not want to be on his bad side. In the newest trailer, probably the last major one we’ll see ahead of Civil War’s release in May, the conflict is worse than ever between Cap and Iron Man, who take opposing views on the Sokovia Accords. The heroes have been at the center of a lot of battles over the past few years but even though they have saved the world more than once, the public is concerned by the death and destruction left in their wake. There’s a lot to unpack in the newest footage. Let’s dive in, shall we? We begin by traveling to a remote location in the mountains, where we find Winter Soldier being held in a heavily guarded vault. Captain America talks about his duty to protect civilians and how he and the rest of the Avengers can’t always save everyone. There might be a duality to his statement, because this movie, in addition to the division over the Sokovia Accords, will be about the reconditioning of Winter Soldier, who is Cap’s longtime friend, Bucky Barnes. We see news footage of the previous conflicts the Avengers were involved in, including the Chitauri invasion in New York, the fall of S.H.I.E.L.D. in Washington DC, and the Ultron offensive in Sokovia. Thaddeus “Thunderbolt” Ross is lecturing Captain America and a few other Avengers, explaining why the Sokovia Accords need to exist. “Captain, people are afraid,” Ross says. We see an explosion rip through a meeting, which is likely being televised to a worldwide audience. There’s an empty podium in the center of the shot as people recoil in horror; it’s a devastating explosion, shattering the entire side of the building’s glass. We get a shot of T’Challa (Black Panther; played by Chadwick Boseman), who appears to have been in that room during the explosion. A mysterious base emerges from the ocean, which looks like some kind of prison, although the cells are empty. “I’m sorry Tony,” Rogers says. “If I see a situation pointing south, I can’t ignore it. Sometimes I wish I could.” Considering what Cap saw during the fall of S.H.I.E.L.D., he doesn’t trust the government farther than he can throw it. Clearly Cap and Iron Man are divided and neither one appear willing to budge on their viewpoint. We cut to a shot of Winter Soldier on the run, driving through a tunnel on a motorcycle. Black Panther is in hot pursuit while Captain America is close behind. This is one of the more thrilling sequences in the trailer, as it shows what kind of capabilities Black Panther possesses in that vibranium suit. The sense of speed here is incredible; he has to be running 60 miles per hour or more. Black Panther draws his claws and pounces on the motorcycle, taking Winter Soldier down. The result of some sort of explosion brings down the tunnel behind them. Iron Man is seen engaging a watch that doubles as a gauntlet. He performs some CQC with Winter Soldier, who fires a gun at Iron Man at point blank range. We’ve seen this scene before but it’s still shocking to see Winter Soldier try and kill Iron Man. There have been suggestions that Winter Soldier is on the mend following his involvement in Captain America: The Winter Soldier, but he still looks like he’s possessed, and willing to kill whomever. We get a few more quick cuts, followed by a shot of War Machine getting blasted out of the sky. It’s unclear who he gets shot by but it certainly suggests that he doesn’t make it out of the movie alive. I can’t imagine someone on Captain America’s team actually kills him; I don’t think anyone on his team even possesses such a powerful weapon. But the trailer is cut to make audiences think Cap or Winter Soldier is responsible. Iron Man sits by his fallen comrade as an airport burns behind him. This is likely after the two teams fight but all of the destruction suggests a third party gets involved. “I was wrong about you,” Iron Man says. “The whole world was wrong about you.” It’s unclear who he is talking to but it’s probably Captain America. A S.W.A.T. team emerges from a moving truck, with Crossbones ominously in the back. There’s a seal on the wall but half of it is obstructed by the fence; we can see the letters IFID. This could be the Institute for Infectious Disease. Does Crossbones want to get his hands on something to unleash upon the world? Supposedly that’s something Baron Zemo, played by Daniel Bruhl, is going to do. Later on in the trailer we get a few more shots of Crossbones and it looks like all of this fighting takes place in Wakanda, which is the fictional nation where Black Panther lives. “This doesn’t have to end in a fight, Tony,” Captain America says. 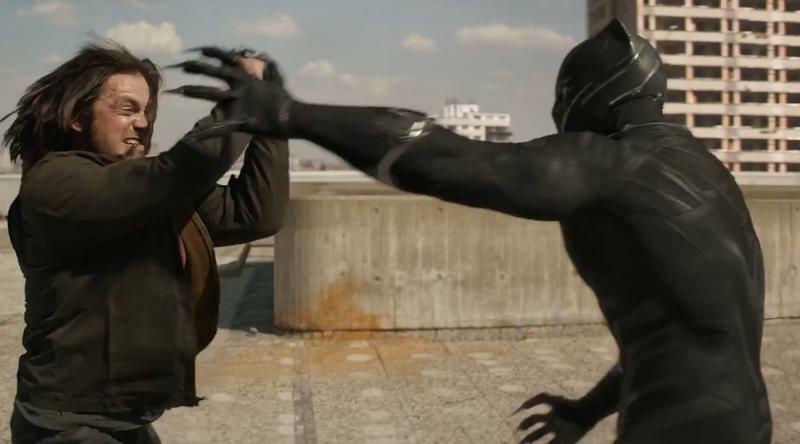 We see the two frenemies fight; Winter Soldier can be seen in the background. What’s that on display in the room they’re in? Scarlet Witch is seen using her incredible powers to subdue Vision. There’s another body on the floor but we can’t tell who it is. And the shot everyone has been waiting for: Hawkeye shoots an arrow with Ant-Man hitching a ride. It looks like he eventually lands on Iron Man’s armor but it’s tough to tell. Crossbones and Captain America fight in a crowded outdoor market. Spider-Man jumps into action, announcing his presence by snatching Captain America’s shield while the two teams fight at the airport. This is our first look at the character in action. His suit is bright and webbed, as expected. His Spider-Man seal is much smaller than what we’ve traditionally seen onscreen and features a lot more red (with some black) than what we saw with Andrew Garfield’s suit. Notice how part of his costume is mechanical, suggesting this might be what Tony Stark gives to the hero as a gift to be on his side.